IMG_4794, originally uploaded by Bassline Audio Visual. WOW I have to say that your website is quite the place to find the answers your looking for so thank you so much in helping people find the right answers to keep their wonderful fish alive and well! I was wonder now if you could help me…I bought a betta fish about a week ago and had him in a bowl at first then decided what kind of home is this I wouldnt want to live my life in some dumb fish bowl so then I decided to buy him a 2.5 gallon fish tank with filter and gravel and I have a fake plant in there for him I leave the light on from about 7:30pm till about 11:00pm plus all the sunlight he gets during the day is that okay to keep the light on that long I just dont like the idea of him being in the dark? Furthermore I was wondering the filter I got for him is 1 of those kinda cheap filters that has a high, medium and low speed I keep it on the low speed but it seems as if its not filtering at all barely any kind of stream coming out the top of the filter and the waters cloudy but then when I put it on medium power it filters great I dont want him to get sucked up into the filter though and I dont want him to be stressed to have to swim so hard Im just confused and depressed because I want him to have a great life for as long as he can. Any information would be so helpful and so appreciated please get back to me asap Loui’s scaring me I dont want him to die! OH and incase you couldnt tell this is my first betta LOL 🙂 . ANother thing that I thought I’d throw in there since Im asking so many questions already is hes got filmy stuff on the top of his water and hes got build up on the sides of his tank what can I do to get rid of that? Thank you soooo much again your the reason bettas get to live such a long life your such a great source of help and answers and the pet store people are killers they dont care since its not their porblem so thank you! A: You asked lots of great questions so I will try and answer them in order. In terms of lighting, Bettas, like most animals, use queues from nature to help them know when to be awake and when to sleep. Bettas have a natural sleep cycle that corresponds with the sun. When it’s light, they are awake and when the lights go out you can often catch them sleeping in their plants or along the bottom of the tank. I like to give them about 12 hours with the light on and 12 with it off but a little more or a little less doesn’t seem to cause any noticeable stress. One thing for sure is that you don’t have to worry about turning the light off on your Betta. He’ll appreciate the chance to catch some “Z”s. Determining whether or not your filter is strong enough or too strong is something that a lot of Betta keepers deal with. The sludge you see on the water’s surface and aquarium glass is called detritus or “mulm” and may indicate that you need to turn up the filter a little. Detritus is made up of organic compounds in the water and isn’t typically harmful but can be an eyesore. Typically, to get rid of it, aquarists create a little more water movement. Since your filter has an adjustable flow control I would recommend turning it up to medium and observing things for a couple of days. If your Betta is really struggling to reach the surface or is cowering completely, then you may have no choice but to turn it down. Another thing you can do is split the difference between low and medium speeds by setting the filter control to medium and adding a few more silk aquarium plants. Extra plants in the water tend to help disperse the water flow making it easier for your fish to deal with the current. If turning up the filter doesn’t remove the detritus you can remove it from the water’s surface by folding a paper towel in half and scraping the folded edge across the surface. Detritus that is sitting on the tank bottom can be sucked up with an inexpensive turkey baster, a tool that often comes in handy with Bettas. Congratulations on your first Betta. I’m thrilled to hear you are doing your homework and providing your fish with great care. why don’t betta fish eat suddently? I’ve had my betta Patrick for a while now in a 7 litre tank, without a filter. I’ve just done water changes once a week and he seems perfectly happy. Today I put in a filter (it bubbles a lot) and after about 6 hours I checked on him and he was sulking on the ground, with a white chin and glassy eyes. His fins were also ragged looking and he was moving around really slow. I think he is stressed out by the noise and bubbling of the filter, so I turned it off. After it was off for a while he was back to his old self and hungry as usual. What should I do? I really want to have a catfish live with him, but I would need a filter for the catfish to survive. Help?? Hi, I’m responding about your Betta being stressed about the filter. Yes your most likely right, he could be stressed, but if you give him a little time and possible less “bubbles” he will get used to it. Just like when a human has to start sleeping with an oxygen mask. It takes time. 🙂 good luck. Hope I helped out. So I have a Betta and his tank came with a filter. The filter is a tube that sits at the bottom of the tank and shoots bubbles out of the top. the bubble cover most of the top of the tank and i feel like its freaking the little guy out. Will it be ok or should i get a new filter? Brutus(my Betta) was happy at first bossing the snails and corys’ around and hiding in his little divers helmet but things changed and he began to pick a spot above the filter and only came out to feed and ignored the other fish/snails.I felt Brutus was getting depressed that he couldn’t explore the whole tank without getting pushed around by the current. I have a Beta i (got him from walmart) i’ve had him for 3 years now and just introduced him to my gourami (they are doing fine not eating each other) but now i think he has swim baldder disease…help?! If you haven’t already, check out our page on Swim Bladder Disorder. Let us know if you have any questions. also im worried about they filter and maybe if thats whats causing him stress on his SBD should i turn it off or what? I am getting a Betta this week and have been researching everyday for the last 2 weeks, but I’m still confused! Is it good to have a filter? The tank I’m planning to get is a 1.5 gallon with a light and it comes with a filter. I am also getting a heater and fake plants. Is the tank big enough? Or should I switch to a 2 or 3 gallon? Should I use the filter? Please help! You are such a kind person to help all these people with their betta’s, so thank you and please answer! I have seen these tiny 1.5gal tanks with filters online but I’ve never seen one actually in use. It is so small that it is hard for me to imagine it could work well. I’d be afraid the current would either be too strong or such a small trickle that it could hardly support the helpful bacteria. When it comes to fish tanks, bigger is almost always better. A 3 gallon tank is still VERY small (can sit on a nightstand) and will provide a little more swimming space for your betta and you can probably go a few days between cleanings. You won’t regret upgrading to a 3 gallon. I have a Betta is a 10 gallon tank and use a filter. My Betta doesn’t mind the filter at all, but I made sure to get a silent filter. And I have had him for a year with a filter and he doesn’t seem stressed at all. This is my 3rd betta in the last 2 months and I dont know what to name him! Hello, I have a male betta fish and for the past couple of days, he hasn’t been eating or swimming. He’s just been laying on the ground, breathing. I think its the water since I use tap water instead of distilled water. However, i boil the water and make sure its clean. Please asist. Thanks. Hi there! Great site, and thanks for all the detailed info on Betta fish. Named him Cyrus. I bought my Crowntail Better a month ago, with a Deep Blue 1 gallon tank, one live plant, a thermometer, some gravel, and two toys. A week later, I bought a very small filter for a 1-3 gallon tank, but it seemed so strong that he would be pulled over to the filter. So I picked up a foam cover. I have a long stemmed filter that goes deep into the tank. Today, I upgraded his tank to a Deep Blue 5 gallon, with hooded light cover, and a second plant. So now he has 2 plants, three toys, and the filter. But the filter still seems like it’s pulling, or too noisy for him, and he seems to cower in the corner and stress out. 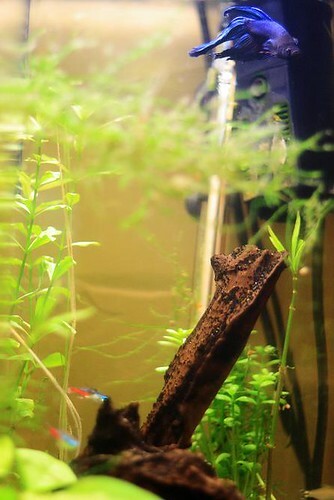 I really want to keep his water clear and safe, and yes, I have turned the filter down as low as possible. I’ve found a lot of great info on this site; thank you. I have a question about filters. I have a Top Fin 10 filter. It has no flow adjustment knob so I can’t turn down the current. I have found a way to spread out the current and it has helped a lot. I’ve just noticed that in certain parts of the tank it seems like he has to work a little harder to swim around. Before I had him in this tank he was in a bowl with no filter so he was used to NO current whatsoever. Does he just need some time to get used to the small amount of flow, or should I try to find a way to slow the filter down more?